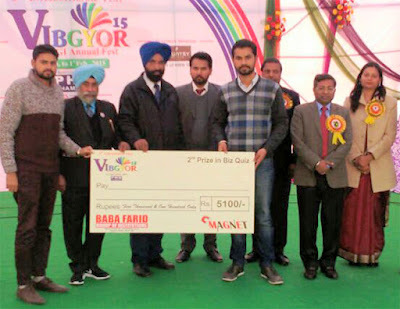 Desh Bhagat University Faculty of Management and Commerce students, Manpreet Singh Gill and Lovepreet Singh of MBA Final have brought glory to the university by winning second position in Biz Quiz contest. This quiz was organised during VIBGYOR-15, the annual fest of Baba Farid Group of Institutions, held recently at Bathinda. The quiz event was based on IQ quizzes, Brain Teaser, Reasoning and Business related issues. More than 44 teams of different institutes from across the whole north region were in the fray. The team of both DBU students entered the final and after tough competition, they were declared runner-up and awarded with cash prize of Rs. 5100. This was disclosed by Pro Chancellor of Desh Bhagat University, Ms. Tejinder Kaur. While felicitating the students, she said that educative events like quiz contests, debates and group discussions are an integral part of our education and to promote the same among students, Desh Bhagat University provides all types of incentives and facilities to the outstanding students. Desh Bhagat University Chancellor Dr. Zora Singh, while congratulating the students over their achievement, said that these students have proved that they are different from the rest and also capable of achieving great victories in every field. Vice Chancellor Dr. Shalini Gupta and Pro vice-chancellor Dr. Shantnu Chatterjee also congratulated both the students and wished that they will make still higher achievements in their future lives. It is worth mentioning that Desh Bhagat University gives full importance not only to research, innovation and other scholastic activities but also to co-curricular and sports activities. Both the students give all the credit for their achievement to state of the art facilities available in the university and the able guidance of their teachers.